This time I would like to share with you my experience of making Persian bread. As some of you may have understood, I have an infatution with bread and baking. It never stops to fascinate me, the types, techniques, the various ingredients and the nearly infinite amount of products. My close Persian friends and sisters Sara and Nahid, helped me discover the many wonders of the rich Persian cuisine, offering endless amazing dinners. Colorful, varied and truly delicious. Nan-e Barbari is a type of flat bread, the name means «related to the Barbars». These are a people living near the eastern borders of Iran. After it was brought to Teheran, it became popular. It is the most common bread in Iran and often served with Lighvan cheese, similar to Feta cheese. It’s outside crispiness and inner softness, makes it ideal for scooping up sauces from the plate. It is also called Tabrizi bread, because of it’s connections with the city of Tabriz. Before baking, the dough is covered with roomal, a flour paste consisting of flour, water, oil and sometimes sugar. This gives it a crispy texture and golden appearance. In my recipe the roomal is just flour and water, giving me equally satisfying results. This recipe is enough for two oval flat bread or six smaller. Mix the yeast and water in a bowl. In a second bowl mix the two flours and salt. Let the mixture pass a sieve into the first bowl. The consistency of the dough will be quite sticky. Let it stay covered for 10 minutes. Take the edges and fold into the center 10 times, taking care to change sides. Cover and let stay for 15 minutes. Repeat the folding process again. Cover again and let stay for 1 hour. Meanwhile warm oven til 250 C, preferably with a baking stone for best results. Mix 2 tbs flour and 6-7- tbs water in a casserole. Cook on low heat, mixing until you get a liquidy roux, taking care not to cook to long. According to my experience, the roux needs to be smooth to brush the dough. After the 1 hour rising of the dough, it will be full of air bubbles. Put the dough on a floured surface, dividing the amount of dough needed with a dough knife. Fold the first piece into a round shape and stretch it to oval shape. Put in a form on baking paper. Stretch lines along the dough with your fingers or with a round shaped tool to create a deep line through the bread . Brush the roomal on the bread and spread the Nigella, sesame seeds and coarse salt on the surface. After putting it in the oven lower to 220 c. Bake for 25 minutes or until tanned with brown color and the bread gives a hollow sound upon tapping from the bottom. Try baking all the bread at the same time, preventing it from rising too much. If not, put the rest into the fridge. If you have any questions, I will be happy to try to answer them. This time a want to share with you a dessert. It’s oriental, colorful and slightly different. It is not heavy, not too sweet But most of all, it’s easy to prepare. We recently had it with some friends who came over. And they very much liked it! This is a Thai dessert that is used with banana. It is usually served warm but my recipe is served cold. To make a new twist, I decided to add to banana different fruits, mostly tropical. I used mango, ananas, kiwi, grapes as well as some apple. I add crushed lemon grass in addition to the traditional recipe and chose not to use 1/2 tsp jasmine essence. The recipe is for four-five. Combine above ingredients in a casserole. Bring to boil, reduce heat and simmer for some minutes. After cooling it down and pouring it in the plates, added 1/2 a mango, a quarter of an ananas, 1 banana, 2 kiwi, 1/2 an apple and some halved grapes. 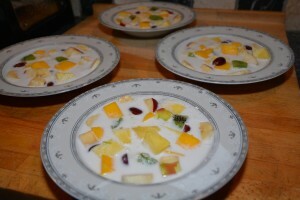 All the fruits are roughly cut in cubes. I did not thicken the soup, but due to the added coconut powder, it got the right consistency. You can add some lime to freshen the taste. Feel free to try and experiment for yourselves. The white background with the chopped tropical fruit, makes a nice contrast. As well as an interesting celebration of tastes in the mouth. Here is a dish we had last week. It seems to have captured the heart of my husband as well as my three children. As it happened, we enjoyed it on a shabat evening dinner, the occasion for special dishes, small surprises and spending some time together. Since l have three teenagers at home with plans and priorities, I went for something quick. And since one of my boys wanted something Indian, this recipe came to my mind. It contains aromatic spices, soya sauce, coconut milk and chicken. Easy to prepare and in less than an hour you can have it ready. You can prepare it in advance and grill the chicken just before serving. The recipe is for five. Heat oil in large saucepan. Add chicken, turning and removing it when brown on all sides. Add the onion and stir until soft. Add garlic, lemon grass and all the spices and stir on medium heat for a few minutes. Add the chicken to the pan, coat it with the sauce mixture and stir in the coconut cream. Bring to a boil. Reduce heat, cover and simmer until tender. Remove chicken and put it under hot grill until crisp all over. Boil sauce until reduced by a third. Stir in fresh coriander, add the chicken and serve with white Basmati rice and nan bread. (will come soon). I used just one can of coconut and that worked just fine. This recipe was a big success in our home. It produced a lot of compliments and left everyone with a happy smile. Being from Israel, l got the chance to try many different kinds of food, as part of the people coming from so many countries. This melting pot of backgrounds, created a wide range of dishes. In addition, people often live in mixed neighborhoods as well as many families being mixed,bringing with them the different culinary traditions often in the same family. Each group kept the different food culture they brought with them from before and of course the love for the culture. The different kitchens from Europe, North Africa, the Mediterranean, Arab, Etiopia, Russia and the countries around, together with the influence of the American, Asian and Japanese kitchen, are creating an indigenous cuisine that is shaping the local food scene in Israel. Many dishes of various origin, fits to be eaten for a weekend breakfast. Today I made Khachapuri, a Georgian dish. There are different versions of this. 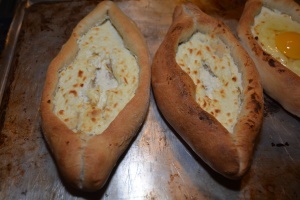 Basically it is a dish in which open dough is filled with a special Georgian cheese and topped with an egg. Since Georgian cheese is hard to find, I have made a version combining feta and ricotta. The dish comes in different shapes, usually round or oval. It can be served at any time but is well suited for breakfast. Mix the flour and the yeast in a big bowl. Make a central depression into which you add the water, butter or oil and salt. Mix the dough. If the dough is sticky, add some more, up to a quarter of a cup of flour. Cover the bowl to let the dough double in size. Mix the dough again and divide info five pieces. Let it rise again on a light flour surface, covered. Meanwhile, mix the two cheese and the salt. Be careful as the feta can be salty. Open each of the dough to a circle with a rolling pin. (not too thin) Spread in the middle of every circle the cheese filling. Pick up the dough from each side and put them together at the edges to a boat shape. Put in a form with a baking paper and bake in preheated oven at 200 C for 15-20 min. Take the form out of the oven and with the help of a fork, push a bit to the side the cheese filling and break an egg in the middle. Spread some salt on the top and put back in the oven for another 5 min or until the egg is done to your preference. Recommended served with salad and a picant sauce. Comments: According to my experience, each piece is quite big and requires a quantity of filling. It is therefore recommended to divide the dough to ten pieces instead of five, giving somewhat smaller portions. You can also freeze the pieces after baking and before adding the egg, thus preserving some of it for later. Hope you like it and that it gives you food pleasures… More to come soon.